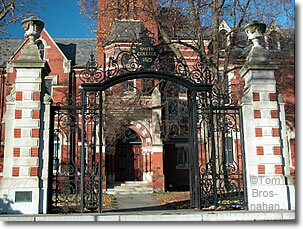 Smith College is among the major points of interest in Northampton MA. The pretty campus of Smith College, founded in 1871 and located just at the edge of Northampton's downtown shopping district (map), is worthy of a stroll. Renowned as one of Massachusetts' finest undergraduate colleges for women, Smith boasts many famous alumnae including former First Lady Barbara Bush, French chef Julia Child, author and aviator Anne Morrow Lindbergh, Margaret Mitchell, author of Gone With the Wind; former First Lady Nancy Reagan, feminist writer Gloria Steinem, and poet Sylvia Plath, among many others. You can arrange for a campus tour by contacting the Office of Admission, 7 College Lane, Northampton MA 01063 (tel 800-383-3232 or 413-585-2500).